A cultivar of Camellia japonica L., ‘Myrtifolia’, the ‘Myrtle-leafed camellia’, has flowers to about 7.5cm across, deep rose when open, becoming paler, the flowers freely produced. It was imported from China by Greville for Kew in 1806. [Don, ICR]. The camellia usually grown as ‘Myrtifolia’ in Australia today is a later cultivar. ‘It is of much smaller growth than any of the other kinds; the leaves are also less, and it is more tender and difficult to increase.’ [LBC no.354/1819]. ‘The leaves, though the smallest of any of the varieties which we have seen, are rather too large to warrant the name of myrtifolia. 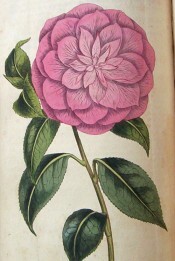 The flower is round and compact, with the inner petals gradually diminishing in size; approaching, except in colour, to the Bourbon or double white variety.’ [BM t.1670/1814]. ‘#11. Camellia japonica myrtifolia. Hort. Soc. Trans. Myrtle-leaved Camellia: There is probably no longer a doubt that this is the same variety that has been cultivated under the different names of large myrtle leaved, small myrtle leaved, involuta or Lady Long’s. It is also said to be the kind known in china as C. Hexangularis. It was introduced in 1808. It is a very beautiful variety; the flower of a pure rose colour, very compact and regular in its formation, after the style of the double white; and is said to be a little fragrant, although I could never perceive it. It is not unusual, but I have seen a few perfect stamina, and with the pollen, impregnated the warratah, and obtained seed. This plant is of very slow growth, not obtaining a large size for many years. The largest I have ever seen is now in the possession of the Messrs. Hovey, being about six feet in height.’ [The American Gardener’s Magazine and Register. vol. 2, p.21, 1836]. Listed in all published catalogues [T.245/1843]. Received per ‘Sovereign’ February 1831. [MP A2948-2]. Myrtifolia is listed in both the 1830 and 1836 editions of Loddiges’ Nursery catalogue, copies of which are held at Camden Park [CPA]. In the 1830 edition it is marked with an ‘x’, which usually denotes common before or long introduced, and in the 1836 edition with a ‘c’, denoting grown at Camden. Myrtifolia was also marked ‘x c’ in an article by ‘G.A.L’ in the Horticultural Register. Although this book originally belonged to James Bowman, this seems to confirm the early date of introduction. [HR p.634/1832]. A plant was presented to the Sydney Botanic Garden on December 24th 1845 [RBGS AB]. Intriguingly the full entry in the Accession Book is ‘Camellia Myrtifolia Captn. W’. The meaning of this is unclear. Camellia japonica hexangularis was one of 12 camellias marked with an ‘x’ in the copy of Loddiges’ 1836 catalogue held at Camden Park but the only one not to subsequently appear in the record, although a further 5 only appear as desiderata to Loddiges’ Nursery. However, hexangularis appears to be synonymous with Camellia japonica myrtifolia as attested by the article in The American Gardener’s Magazine, which probably explains why there is no further reference.